As part of the CES cavalcade of announcements, after launching Core-M back in September, Intel is formally releasing their next element of the 14 nanometer story: Broadwell-U. As the iterative naming over Haswell-U suggests, Broadwell-U will focus on dual-core 15W and 28W units from Celeron to Core i7 using 12 to 48 ­execution units for the integrated graphics. A Broadwell-U processor should drop into any existing Haswell-U equivalent design (i3 to i3) due to pin and architecture compatibility, albeit with a firmware update. As with any node change, the reduction to 14nm affords the usual benefits: more transistors per unit area, lower power consumption for a given design, or the potential to increase performance. Ryan covered the details of Intel’s 14nm architecture back as part of the IDF launch, as well as a good deal of the Broadwell architecture itself. The launch today is in essence a specification list with a few extra details, along with potential release dates for Broadwell-U products. The CPUs are already shipping to partners for their designs. The graphics move up to Generation 8, and a lot of architectural detail into this was given by Intel and IDF San Francisco in September 2014 of which some of the important points are highlighted here. There are some clear patterns in the product line. Every unit apart from the Pentium and Celerons has hyperthreading, putting most of the line in a dual core, quad thread scenario. This also ties in with the Pentium and Celeron’s use of HD (Broadwell) graphics, which is a 24 EU design with half of each subslice disabled. The speeds of the Pentium and Celerons are also cut back, despite the 15W TDP and high cTDP down, ensuring that these are the bargain basement units of the line. vPro will only be enabled on i7-56x0U and i5-53x0U series, giving a range if HD 6000 or HD 5500 is needed, however there is no vPro Iris 6100 part being released. The HD 5500 parts will have a cTDP Down of half their original TDP, allowing 7.5W designs to also take advantage of Broadwell-U. The Core i3 15W SKUs have an odd combination involving 23 EUs rather than the 24 EUs that the die is designed with, presumably in order to keep yields higher it gives Intel a chance to still sell those with a single defect. This produces a lop-sided EU design within the configuration, which has its own implications, and we are requesting more detail from Intel as to how this is managed in the firmware. A positive point for 6x00 series graphics SKUs is the memory compatibility on LPDDR3, with these units (having an 5 or an 8 in the 00x0 name) allowing 1866 MHz memory. As our previous Haswell desktop memory testing has shown a small bump away from 1600 MHz DRAM can give a good performance boost when it comes to graphics, especially when the memory speed between CPU and DRAM is the main bottleneck. I would be interested in exploring the difference with this for sure. It might come across as somewhat surprising that a 15W CPU like the i7-5650U has a 2.2 GHz base frequency but then a 3.2 GHz to 3.1 GHz operating window, and yet the i7-5557U has a 3.1 GHz base with 3.4 GHz operating for almost double the TDP. Apart from the slight increase in CPU and GPU frequency, it is hard to account for such a jump without point at the i7-5650U and saying that ultimately it is the more efficient bin of the CPUs. So while the 28W models will get the glory in terms of performance, there are a number of models that can offer just under that performance but for just over half the power rating. This obviously levels battery life for the more efficient design as a significant jump, depending on how the system as a whole is used. Broadwell-U will be derived from two main dies. The larger design contains the full 48 EU (two common slices with 6x8 EU sub-slices all in) configuration for 1.9 billion transistors in 133 mm2, while the 24 EU design (one common slice, 3x8 sub-slices) will measure 1.3 billion transistors in 82 mm2. This puts the size of one common slice with 3x8 sub-slices at 600 million transistors / 49 mm2, and thus the die without the graphics subsystem at all at 700 million transistors for 33 mm2. This would mean the cores, the Last Level Cache, the IO and memory controller all fit into the 700 million. Unfortunately calculating the increases for separate parts is a little more difficult than just comparing numbers due to the different elements of the new graphics, known as Intel Gen 8. 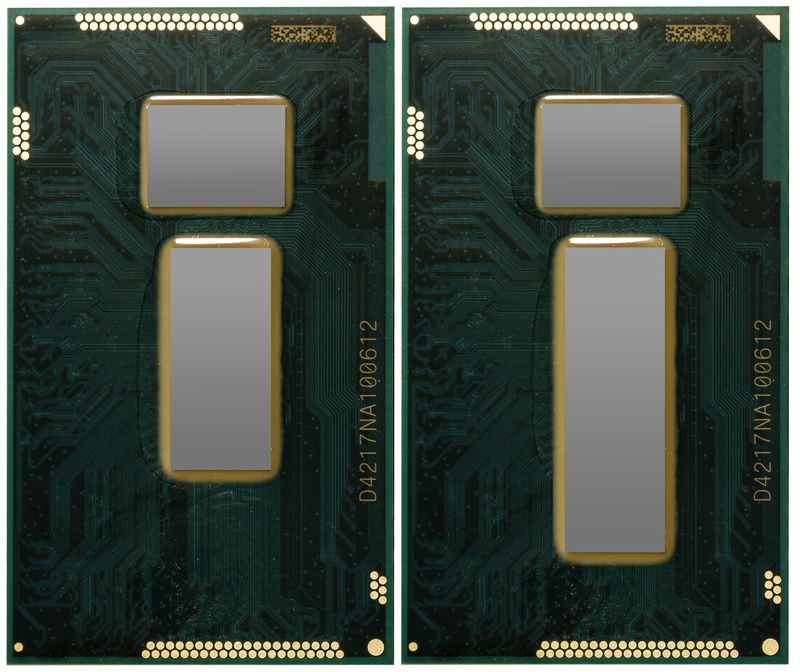 On the left is the 2+2 configuration, giving two cores and GT2 (24 EUs), while on the right is the 2+3 package. The silicon on top is the Platform Controller Hub, discussed later. "It might come across as somewhat surprising that a 15W CPU like the i7-5650U has a 2.2 GHz base frequency but then a 3.2 GHz to 3.1 GHz operating window, and yet the i7-5557U has a 3.1 GHz base with 3.4 GHz operating for almost double the TDP. Apart from the slight increase in CPU and GPU frequency, it is hard to account for such a jump without point at the i7-5650U and saying that ultimately it is the more efficient bin of the CPUs." This is not surprising. This is used to increase the GPU performance. 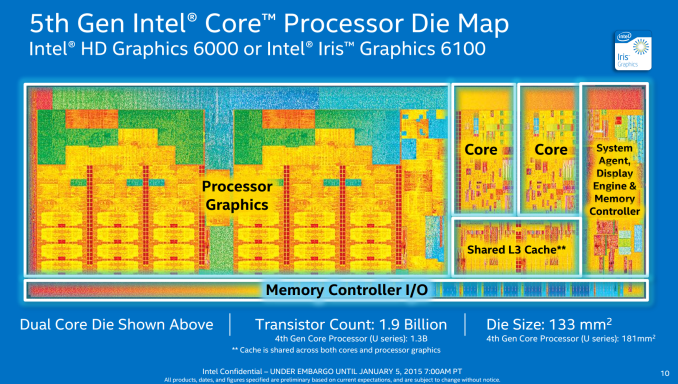 28W CPUs have Iris 6100, 15W CPUs have HD 6000. Looks to me like the 23W ones (i.e. those with the 6100 graphics) will be the only ones to be capable of being near the max turbo clocks for long. "In no way does TDP tell us anything about efficiency." Agreed - TDP is far to crude for this. Intel Desktop CPUs often operate far below TDP, whereas mobile chips are throttled by it. How much? Depends on the laptop, environment temperature etc. Iris 6100 + edram or at least DDR4 bandwidth increases would have made a terrific difference to "retina" and high-dpi ultrabooks / laptops, but now this upgrade is watered to irrelevancy. as i see it the given tdp only ensures operation at base clocks and without a substantial graphics load. operation at turbo clocks requires to overstep the tdp until power draw and or temps are too high and the clock returns to the base frequency. if you look at it like this it's not surprising a 15w sku has a base clock of 2.2ghz ans a 28w sku 3.1ghz. that said the 28w tdp still looks "too high" for the frequency you get out of it, but i guess that this extra power/heat-budget is there for the sole reason so the 28w sku can operate at turbo clocks for longer without throttling down again, plus there is more headroom for a graphics load at the same time. this ensures, even with similar hardware and turbo-clocks, the 28w sku is allowed to produce more heat and in turn get more work done in the same time.